Actually I remembered…sort of. I did get a scan of my interpretation of Caveman Batman for Jose Ramirez. This is a combination of Copic Markers and Micron Pens. This next piece I actually did remember to take a photo of. 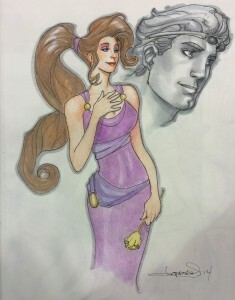 The interesting thing is I did this commission piece last year at Big Wow. The lady I did the piece for dropped by my table this year with her book which I promptly grabbed from her hands and snapped a photo of my contribution from the previous year. 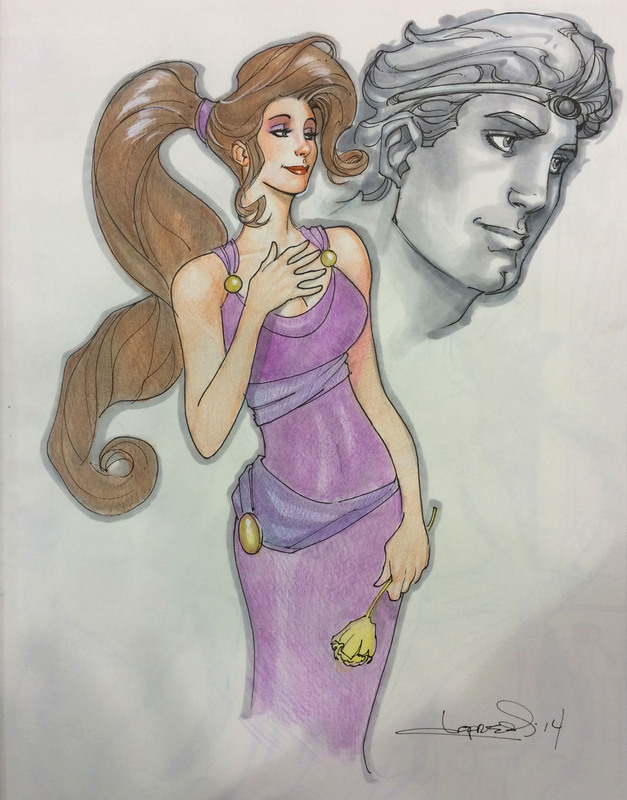 This is obviously Meg and Hercules and it is a combination of Copic Markers and Colored Pencils. Because it is a photo and not a scan, you can see some weird shadows down at the bottom of the picture but it is a decent representation of the actual finished product. So one from this year and one from last. Not bad for a guy that has trouble remembering to take out the trash. The convention season started a couple of weeks ago for me with ECCC in Seattle. A great show for art and artists. My second con of the season is this weekend (April 18-19) at Big Wow in San Jose, which is another great show for art and artists. After that comes the month of May which will be a whirlwind. I will be in Tampa, St. Paul and Kansas City with a store signing squeezed in between. But first things first, If you are in the San Jose area this weekend stop by and see me. I will be doing commission and selling original pages and covers along with prints and sketchbooks. I’m a regular retail store! I need to get better at taking pictures of some of the sketch commissions I do at shows and posting them. That will be my mission this weekend. If there are no posts of art next week here, you’ll no I failed. Either way, come back and read about my Big Wow adventures. Last year at this show I developed a severe tooth infection that resulted in an emergency extraction when I returned home. Let’s hope this time there is less drama! I realized this afternoon how rare free time in my life has been for most of the past year and so far all of this new year. I am working full time for DC Comics (on Convergence right now) and then spending any left over time in the evenings and weekends on my creator owned book, Power Cubed. Normally I would take that extra time and do commissions or art for prints or paint or something else art related. But I rarely had to do it. Now I do. 20 years ago it wasn’t that big of a deal. Now it is tough. I am no longer a young guy trying to make it as an illustrator, now I am a “on the higher side of middle age guy” trying to remain relevant in the industry and still grow in my craft. Doing something you have to do is far different than doing something because you want to. I’m not saying I don’t want to do Power Cubed, I just would rather do it as a full time gig than a part time side project that is taking up all of my sleep and recreational time. It wears you out as you get older, that is for sure. My mind is willing but my body is….well, you know the adage. Such is the life of a freelancer. You can never rest in what you are doing, you always have to be worrying about the next project. The allure is you get to be your own boss and work when you want to. The truth is you are subject to your client and deadlines like someone who has a regular job. But you usually end up working more hours and don’t get overtime or paid vacations or health insurance but you do have the illusion of freedom which is really quite liberating. Just don’t take the time to meditate on the fact that the reality of it is only in your mind. The upside, of course, is you get to do what you love for a living and to be quite honest, I wouldn’t have it any other way. PS-scan still not done (37 minutes and counting)…. So now that it is official I can release the logo and image for the 1st issue due out September of 2015. As usual I did a few sketches to get an idea of what I wanted to do. Unfortunately I can’t show them to you because I can’t find them! Is it possible that I tossed them without scanning them? With me, anything is possible…. Here is the cover with the logo, anyway. For the record, I penciled, inked and colored this. I did a rough design of the logo and the pro’s at Dark Horse made it look good. You may now be able to see one of the reasons I changed the name from Atomic Toybox to Power Cubed. I had this idea of how the logo would look and how it would be a neat little word play. Although, I am sure people will inevitably call it Power 3 instead of Power Cubed despite the obvious pronunciation clue of the 3 inside a cube! I have already heard the nickname “P3″ being used, which I actually kind of like. Right now I am halfway through penciling the second issue and should have it completed by the end of April. 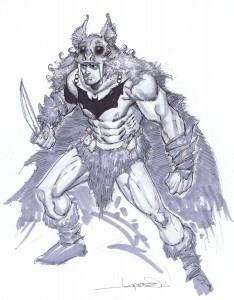 As a reminder, I have brought in Mark Morales to ink issue #’s 2 and 3 so the series will get out on time.